One of the most amazing things about spending the past year at home full-time with EV6 has been making so many memories. I don’t just mean that in the glib way of, “every day together is a new memory,” although that’s certainly true. It seems that I began my time off right on the bounds of the period of time where EV6’s long-term recall really kicked in. She has a few fleeting recollections of events prior to last April, especially ones where she’s seen many photos to reinforce them. Yet, starting around the time I began to take trial days off from work, her recall is incredible – crisp and complete, even for adventures I didn’t capture in photos and have since all-but forgotten. One example is Morris Arboretum. This was one of the first big new things we did together last spring in a special team-up adventure with our friend Miss Jess. At the time, EV6 was a bit too young to appreciate the rose garden and abstract structures. What stuck with her was their “Out on a Limb” setting, where you can climb from tree to tree like a bird or a monkey on a series of platforms and nets. EV6 has brought it up from time to time in the past year, but when Spring hit us in full bloom in the past few weeks it suddenly became the only special trip she’d request! Obviously, Out on a Limb was the first thing we bolted for when we arrived. EV6 was a bit tentative on the nets last year, but this year she was like a spider crawling on a web! We spent nearly an hour clambering around, pretending to be animals, and making friends before we continued to other experiences. Another big draw for kids at Morris is the Garden Railway, a small-scale village with a network of intersecting train tracks criss-crossing it. It doesn’t open officially until Memorial Day, but we lucked into the staff performing a check-up on some of the trains so we got to see them in action. 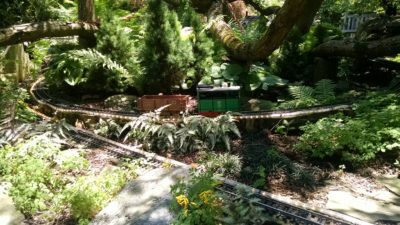 I’m not one for watching miniaturized trains circulate on a track, but the incredibly manicured greenery along its path is just as much as a draw. Together, they lend the feeling of peering into some sort of enchanted tiny world. We’ve grown to be massive fans of Longwood Gardens in the past year, so it’s hard not to compare that with every garden or hike adventure. Morris Arboretum isn’t as sprawling as Longwood, or filled with as many cultivated gardens and flowers. However, there is the sense of being inside of nature at Morris, rather than just walking past it on a path or seeing it on display. While I still say a Longwood Garden membership is the best deal for the least-crowded attraction, it’s a real commitment to drive there. 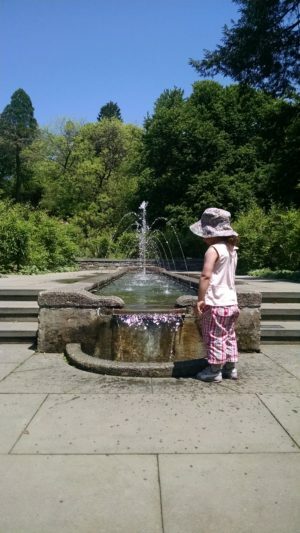 If you want to stay more local and be surrounded by just as much greenery, Morris Arboretum is a wonderful substitute. 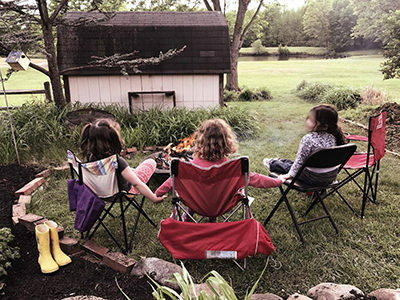 Spring Thing: s’mores in the yard! Last night Lindsay and J gave me the night off from cooking my elaborate bi-weekly desserts and substituted making s’mores! It was EV6’s first time roasting marshmallows over a fire, made all the more amusing by the fact that L&J’s fire pit is actually EV6’s Nana’s old, unused fire pit, given to her by E & I as a birthday present early in our relationship, which was later upcycled by L&J after Nana abandoned it in the process of downsizing to a smaller abode! Personally, I’m not really a fan of anything sticky nor made of chocolate, so I was more on marshmallow roasting duty than anything else … which I completely failed by setting our marshmallow on fire. It’s good that I have people like this in my life, because honestly without them it’s likely that calamity would befall me every time I set foot outside into nature. Last night I went to an actual dance class for the first time. Not Zumba. Not step-aerobics. A dance class in Philly for parents, adult beginners, and other gawky human beings with necks like storks. I’ve always loved to dance, ever since my mother would hold impromptu dance parties in our living room to records like Rufus and Chaka Khan and CeCe Peniston’s “Finally.” I lived for weddings and school dances, where I had an excuse to show those skills off on a real dance floor. For whatever reason, it never occurred to either of us that I ought to take an actual dance class. While I’ve gone mashed-potato for mashed-potato with my mother for years, it isn’t quite the same thing as learning choreography. In the ensuing years I’ve taken a lot of gym classes with dance elements, but they’re always more work-out than dance steps. I had one fantastic Zumba instructor who did the bare minimum of Zumba and then plugged in tons of great pop and hip hop into the rest of the class and pretty much treated it like we were training to be in music videos. I was sorely disappointed to find that wasn’t the norm in other classes. This week brought an all-new adventure for us – The Delaware Children’s Museum! We loved this museum. It is a completely different beast than the well-known Please Touch Museum in Philly. Please Touch is themed around small-scale, hands-on activities and role play, and it’s kind of expensive at $19 a person, plus parking! If you’re going to go more than twice in a year you might as well be members. Delaware Children’s Museum was much more geared to larger exhibits and full body engagement, whether that’s climbing, zooming around on person-powered scooters, or playing dress-up on a pirate ship. It had six large play areas, some with just a single theme (like climbing or scooters) and others with multiple engagements (a lemonade stand and restaurant with other counting activities). It’s also just $9 per person! And, not for nothing, it’s in the middle of a huge, free parking lot with two decent restaurants, as opposed to Please Touch, which is somewhat isolated. 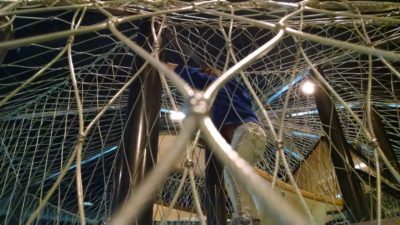 EV6 probably would have spent her entire day just exploring the ant-hill climbing structure directly inside the front door, but she also enjoyed the physical fitness exhibit and retooling the magnetic race car. The drive to Delaware from our house is only about 10 minutes difference, and it seems like the museum is much less crowded on weekdays. This Spring Fling gets a solid thumbs up from both EV6 and I. As it turns out, I really like hiking. 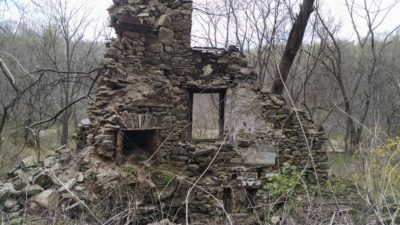 A ruined old house on Ridley Creek State Park Trail; there were also some lovely private residences, some of a similar vintage. This is one of those things that’s not surprising at all now that I pause to think about it. I have infinite stamina for walking and I enjoy nature the most when I’m passing through it at a pretty steady clip rather than enjoying it from a stationary position. While E enjoys nature perhaps more than I do, she does not possess my unlimited stamina for walking. Thus, after a terrifically fun and challenging hike with the assembled Drexel crew last Memorial Day, I got it fixed in my head that I had to convince EV6 to enjoy hiking. I had positive reports from other parents that this was the sort of thing you could use to occupy a child’s time and attention at low cost. It seemed like a good tactic. A not-quite-three-year-old is a bit too small for a hike of any substance, but that didn’t stop from from hyping EV6 up about hiking from the moment I returned from that trip last year. Any time anyone I vaguely knew uploaded a hiking picture I made sure EV6 saw it. We talked about how it would be challenging, and how it’s for bigger kids. We got a membership to Longwood Gardens to start getting used to traipsing around for hours outdoors. Everything was proceeding as planned. I was about to have a hike-loving child at home with me for this Spring! And then we did our little Darby Creek excursion the other day and I faced the cold, harsh light of reality: it’s unreasonable to expect such little legs to walk more than two miles in a day. EV6 is only a bit over half my height, so my two miles probably feels more like four miles to her! Whether it counts as two or four, that’s only about 60 to 90 minutes of hiking, all told. Not super satisfying, especially if it involved a long drive to get there. When we awoke this morning and glimpsed an ultra-beautiful day outside, EV6 and I determined we could not simply roll on with our typical Tuesday morning errands routine. 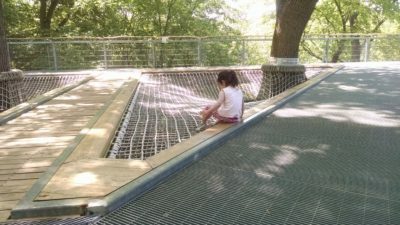 EV6 has been agitating for a return trip to Morris Arboretum’s Tree Adventure, but I find their admission to be a bit steep for what’s on the grounds – especially when we’re members of the massive Longwood Gardens! Still, I liked her plan of getting outside and being surrounded by trees. Then, I remembered reading a Philly.com article about the newly-opened Chester Creek trail, a newly rehabbed stretch of old train tracks that’s not far from here. The article unhelpfully didn’t provide a website or an address for the trail, but it linked to The Circuit Trails, a very pretty and mostly useless website that also lists trails without directions or maps, but links to ChesterCreekTrail.org, a site about the trail without directions or a map. Wow, this internet thing is pretty hard to do! Luckily, Circuit Trails linked to the actually useful TrailLink, which revealed the mysterious and previously quite secret location of the the Chester Creek Trail! It was about a half hour away, and I didn’t relish the idea of an hour of car time to take EV6 on her first hike, which might spectacularly fail. Luckily, TrailLink makes it easy to search for other trails in your area, and we found a pair less than half that far from our house! (By the way, the addresses of the two ends of the Chester Creek Trail are North – 439-446 Lenni Rd, Media, PA 19063 and South – 249 Knowlton Rd, Media, PA 19063). The trail we chose was The Darby Creek Trail, a single mile of completely paved trail running north alongside 476 from where it crosses Route 1. Not only was it short, paved, and nearby, it included another feature that won EV6 over: a playground! EV6 was so excited by the prospect of a hike plus playground that I think it was the fastest we’ve ever left the house in the morning! As for the trail, I’d call it more of a pleasant jogging path than a hike, but it’s ideal for practicing with little legs because of the brief length and the even, asphalt-covered ground. That also makes it ideal for kids to practice riding their bikes, especially since there are no interruptions to the trail or sharp curves! There were a few attractive stopping points at the creekside where families were fishing or dipping their toes. The creek was surprisingly unspoiled for lying just a few yards from the side of a highway (it’s shielded by a high retaining wall), and the white noise of the rushing cars actually added to the feeling of seclusion. EV6 decided that she ought to use the mile as interval training. After all of her sprinting, by the end of it she was pretty wiped out and begging for her snack of apple sauce. I don’t think it had quite sunk in that we needed to reverse course and re-walk the entire mile to get back to the car! She wouldn’t have made it back if not for the promise of some playground time at the end. While the walk itself wasn’t so thrilling, its proximity to a ton of our Route 1 errand locations makes it likely we’ll use this for our morning exercise on cool, sunny days like this one in the next few months. Plus, we’ll be back later this week to enjoy a bike ride! 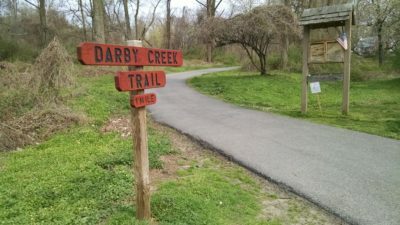 Darby Creek Trail’s address is literally “Darby Creek Trail,” Havertown, PA 19083, but you could also dial in the playground, Merry Place, 600 Glendale Road, 19083.